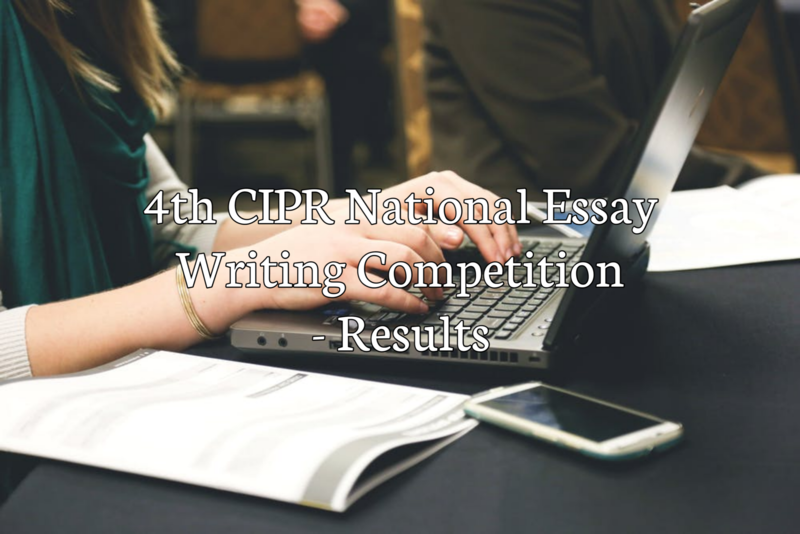 The Centre for Intellectual Property Rights, NUALS is pleased to announce the results of the 4th CIPR National Essay Writing Competition, 2018. The winner of the competition is Mr. Aditya Gupta and Ms. Ananya Jha, from NUSRL, Ranchi. The second place goes to Ms. Neha Shivhare from NALSAR, Hyderabad, and the third place to Ms.Shramana Dwibedi from SLS, Hyderabad. Fourth Place goes to Ms. Meenal Garg from ULS, Chandigarh and Fifth place goes to Ms. Felina Eugina Das from Christ University, Bangalore. The first, second and third rank holders will receive a cash prize and a certificate of merit. The Centre for Intellectual Property Rights, NUALS would like to congratulate the winners of the competition and thank all the participants. 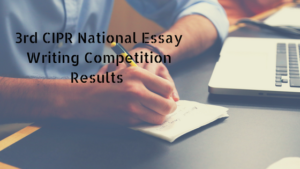 The Centre for Intellectual Property Rights, NUALS (CIPR)is delighted to announce the results of the 3rd CIPR National Essay Writing Competition conducted on the Theme “Innovation and Improvement: Validation of Intellectual Property Rights”. The winner of the Competition is Ms.Ayushi Singhal of WBNUJS, Kolkata for the essay titled "YouTube’s Liability for Copyright Infringement – Lessons and the need for a Transnational Agreement". The Second place goes to Ms. Alisha Mehra and Ms. Anushka Jain from NLIU, Bhopal for the essay titled "Trademark implications of homage businesses". While the third place goes to Mr. Sourav Kumar and Ms. Shraddha Srivastava from CNLU, Patna for the essay titled “Innovation and improvement: validation of intellectual property rights”. The first, second and third prize winners will receive a cash prize and a certificate of merit. 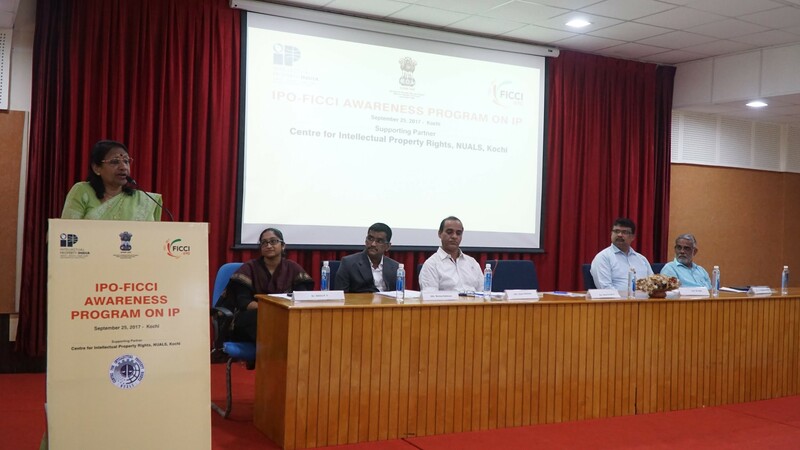 The Federation of Indian Chambers of Commerce and Industry and the Indian Patent Office, in association with Centre for Intellectual Property Rights NUALS, conducted an IPR awareness program for universities at the NUALS campus on Monday, 25th September 2017. The Awareness programme was inaugurated by Prof.(Dr.) Rose Varghese, the Vice Chancellor of NUALS, Kochi. The welcome address was delivered by Dr.Athira P.S., Director, Centre for Intellectual Property Rights. Sri. M. Ajith, Deputy Controller of Patents and Designs, IP Office, Chennai, delivered the Special Address. Sri. Savio Mathew, Head of the FICCI Kerala State Council delivered the vote of thanks. Sessions on Intellectual Property Awareness was conducted by noted Advocate Benoy Kadavan, who spoke on the basic concepts of Intellectual Property, as well as sessions by Sri. V.P. Balagangadharan, Retired Space Scientist, Vikram Sarabhai Space Centre and Chairman of IPR Advisory Committee, Kerala State Council for Science, Technology and Environment, who spoke about the IP Ecosystem in India. The last session was handled by Sri. M Ajith, who enlightened the participants about IP Registration, policy and the initiatives by the Union Government. The programme concluded with a lively Q & A session with Sri. M Ajith and Sri. V.P. Balagangadharan handling the inquisitive questions by the participants. The volunteers of CIPR, NUALS attended a Workshop on Geographical Indicators (GIs) organised under the banner of European Union - India Intellectual Property Co-operation (IPC-EUI) with the support of Confederation of Indian Industry (CII) and the Government of India. Organised at Taj Malabar, in Willingdon Island, Kochi on 16th January 2017. The Workshop is to be the first in a series of workshops held under the EU-IPC Banner. 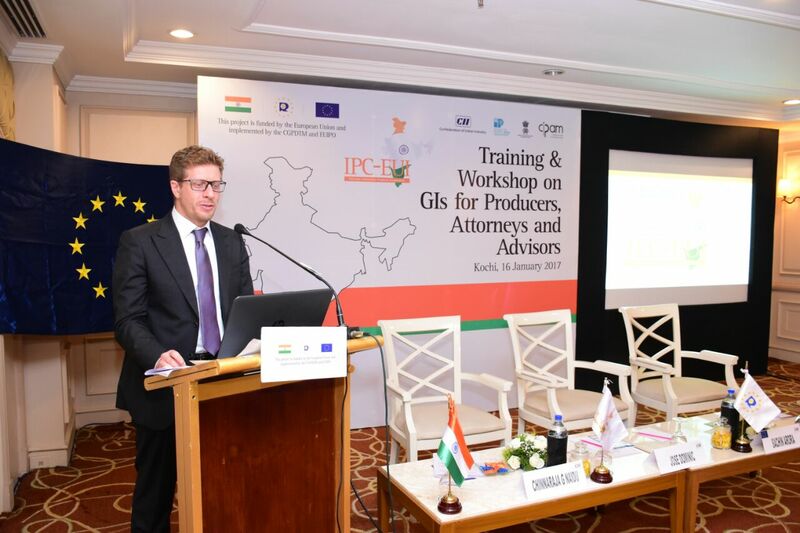 Mr. Elio De Tullio, hailing from Italy (representing the EU Intellectual Property Office) led the first session, on "EU GI System & Types", after which Mr. Chinnaraja G Naidu led the session on "Indian GI system & types", including the concept of authorized user. After a small break, Professor TC James presented two sides of GI story: "The success of Chanderi Sarees in contrast with Venkatagiri Sarees". Then Mr. De Tulio presented the group with a series on various instances of GI & Trademark conflict, their results, etc. After which the partcipants, with the guidance of Prof. James and Mr. De Tulio, attempted to formulate an action plan to register a GI and then discussed the same.